A homeless man who authorities believe may have been cooking in the Rio Hondo riverbed near the Whittier Narrows Reservoir was charged with starting the blaze, authorities said. A firefighter looks out as the Lincoln Fire burned in Montebello on Aug. 16, 2015. A transient believed to have been cooking food pleaded not guilty on Tuesday to sparking a blaze in Montebello during a weekend scorcher. 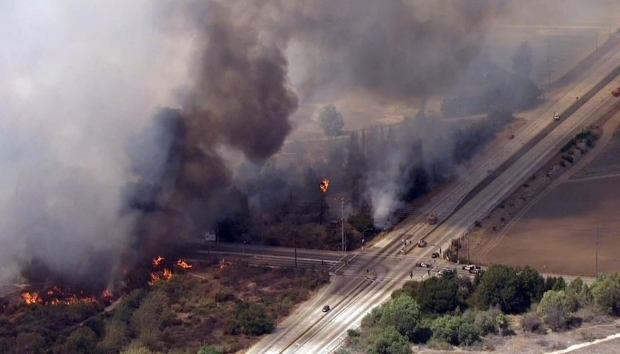 Arturo Miallan Aguilar, 45, pleaded not guilty in a downtown Los Angeles courtroom to a charge of recklessly causing the 370-acre Lincoln Fire in the Montebello Hills. He was in court as fire crews continued to fully douse the blaze. 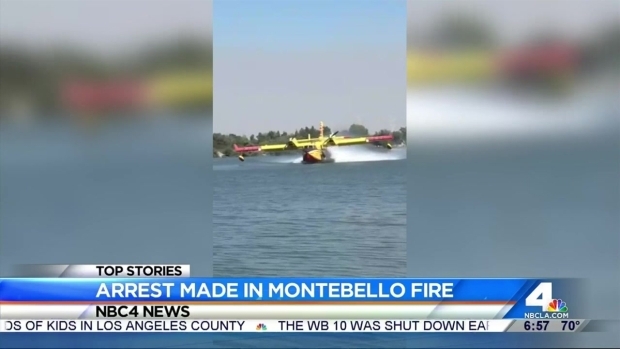 He was arrested Sunday night, hours after the blaze started in the Rio Hondo riverbed in Montebello and spread into the hills. Police said Aguilar was apparently trying to cook a meal when the fire spread. He faces up to three years in prison if convicted, according to prosecutors. Fire crews were setting up containment lines and watching over hot spots of the Lincoln Fire in Montebello to make sure flames don't flare back up during the heat. Annette Arreola reports for the NBC4 News at Noon on Monday, Aug. 17, 2015. Aguilar's bail was set at $20,000. He is due back in court Aug. 28, when a date will be set for a hearing to determine if there is enough evidence for him to stand trial. 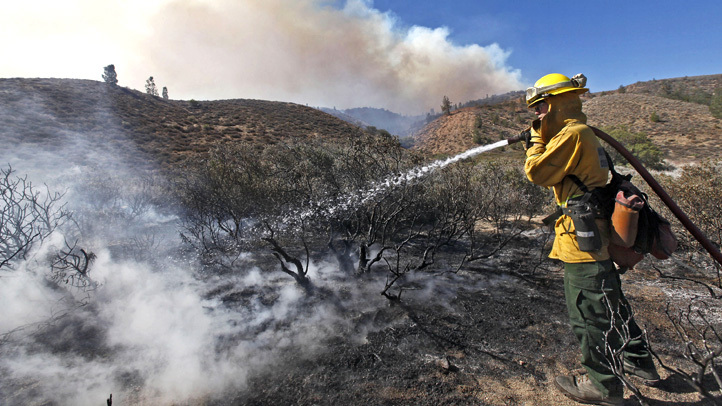 The blaze, which began around 1:30 p.m. Sunday, was 80 percent contained as of Tuesday morning, fire officials said. 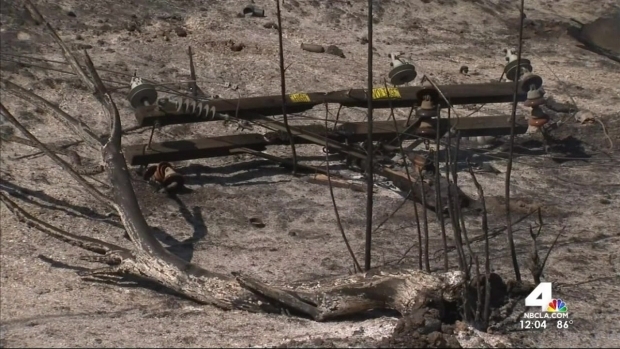 Los Angeles County Fire Inspector Randall Wright said the scene had little active fire remaining, but crews were using water drops and hand crews to fully encircle to burn area to prevent any flare ups. A Southern California Edison worker fell and broke his leg at the scene around noon Monday, said Deputy Montebello Fire Chief Dan Amador, and four firefighters were injured fighting the blaze Sunday. One suffered heat exhaustion, another a shoulder injury, one an eye injury and one firefighter complained of neck and back pain after a Los Angeles County Fire Department helicopter made a hard landing at Rose Hills Cemetery due to a mechanical problem. While no buildings were damaged, there was damage to oil field infrastructure owned by Freeport, he said. The extent was still being assessed. Some area homes were subject to voluntary evacuations while the fire raged. The fire closed stretches of Lincoln Avenue, San Gabriel and Rosemead boulevards and Durfee Avenue, according to Montebello police and the Los Angeles County Fire Department. The eastbound Pomona Freeway was closed at San Gabriel Boulevard around 5 p.m. Sunday, but reopened about 3 1/2 hours later, according to the California Highway Patrol. Fire crews were keeping tabs on hot spots of a fire in Montebello that broke out after a homeless man allegedly sparked the blaze. Annette Arreola reports for Today in LA on Monday, Aug. 17, 2015. It was not immediately clear whether Aguilar had an attorney.